Isiah Factor | The Insite » DRUNK DRIVING SHAME – FAIR OR NOT! DRUNK DRIVING SHAME – FAIR OR NOT! 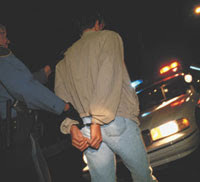 April 15, 2007 | Posted in Uncategorized | Comments Off on DRUNK DRIVING SHAME – FAIR OR NOT! IS IT A GOOD POLICY TO SHINE THE LIGHT ON THOSE WHO DRIVE DRUNK? Many newspapes choose to publish the names of people who have been charged with driving while intoxicated. I was reading my hometown newspaper The Advocate in Baton Rouge, La. and noticed they still do it. I haven’t seen it in the Houston Chronicle or larger cities where I have worked before. But do you think it’s a good or bad policy? Should people’s arrests for drinking and driving be made public in the newspaper through the shame game. I already know any arrest is public through police records but should local newspaper publications take on the responsibility of doing so? And do you think this is something our very own Houston Chronicle should consider or do we have bigger fish to fry in Houston? Just a lot of questions from The Insite! Authorities arrested at least five people suspected of driving while intoxicated in East Baton Rouge Parish and booked them into Parish Prison between 3 p.m. Friday and 3 p.m. Saturday, booking records show. xxxxxxxxxx, 54, 190 Georgia St., third-offense DWI, failure to maintain control and driver’s license not on person. xxxxxxxxxx, 20, 1023 Pine Lane, Mandeville, first-offense DWI, headlights required and reckless operation of a vehicle. xxxxxxxxxx, 21, 795 Molaison Drive, Addis, second-offense DWI and failure to maintain control. xxxxxxxxxx, 1282 Stella St., Metairie, first-offense DWI and equipment violation. xxxxxxxxxx, 19, 7314 Enterprise Drive, Denham Springs, first-offense DWI and blocking a public roadway.